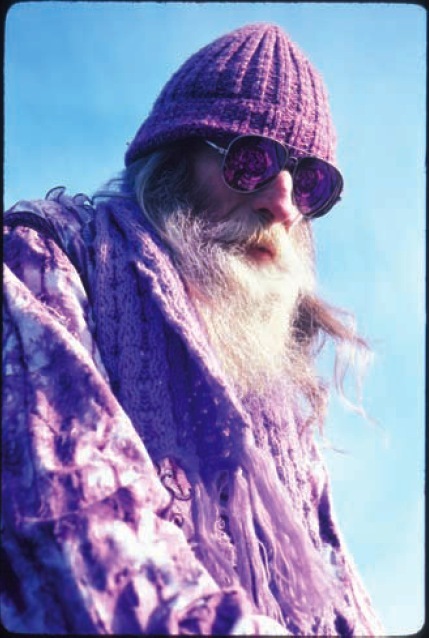 January 8, 2011 is the 25th anniversary of the destruction of Adam Purple's monumental "earthwork" The Garden of Eden. Memorializing the occasion, photos of the artwork and the artist by acclaimed photographer Harvey Wang (also director of The Last New Yorker) will be displayed for the first time at the FusionArts Museum on Stanton Street, from February 1 - 20. 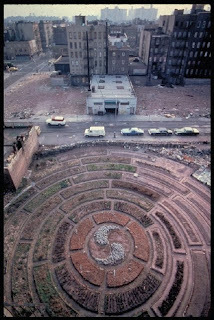 Constructed and maintained from 1978 to 1985, the Garden of Eden was a massive green artwork on the Lower East Side, thriving amidst the rubble of a burning and collapsing neighborhood. 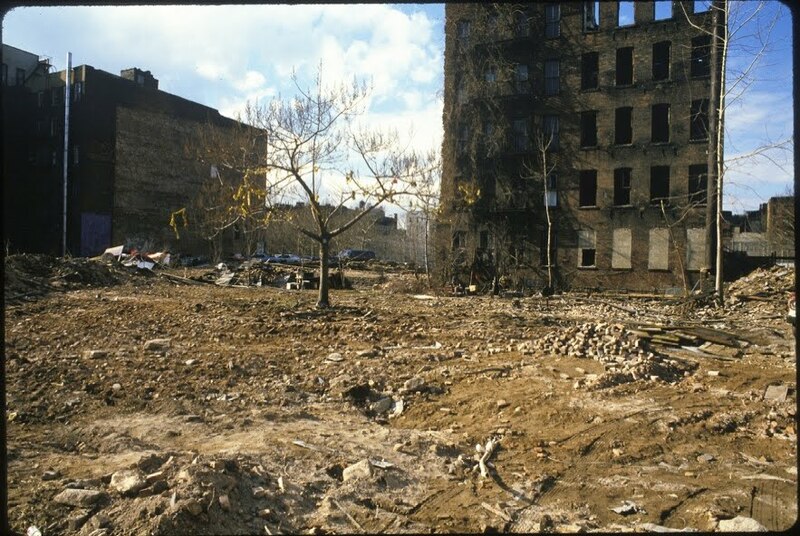 "As the buildings around fell," wrote New York Magazine in 1991, "the garden grew. Soon its concentric circles of tomatoes, corn, and flowers covered five lots and fed its neighbors." According to the press release, by the time of its destruction in 1986 the garden "had grown to 15,000 square feet. Among the many crops and flowers were 100 rose bushes and 45 fruit and nut trees. Adam 'zenvisioned' the Garden expanding until it replaced the skyscrapers of New York." But that was not to be. 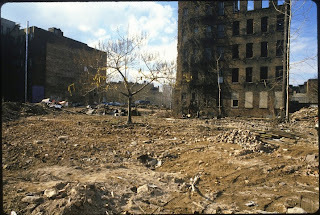 In the 1980s, the city stepped in with an urban renewal plan for the Lower East Side, and a lengthy battled ensued. Purple and his neighbors lost, the city won. Chris Flash reported in The Shadow, "By 1985, Adam says, the city considered The Garden of Eden a threat: 'They couldn't just say go away, so they found a HUD project and got all the local poverty pimps to jump up and down and say we need housing, we don't need flowers. They divide the community, conquer it, and everybody loses.'" Wrote Flash, "Rudolph Giuliani, as US Attorney for the Southern District of New York, oversaw the legal effort to destroy The Garden of Eden." Adam Purple, wrote the New York Times, is "one of New York City's living treasures, an ornery gadfly, a freelance anarchist." One of a vanishing breed. He recently said, looking back on what was lost, "I still feel that it would have been better to kill me and leave the garden." My first place in the city was right up the street from this amazing place. I remember seeing his purple footprints all over the neighborhood. I can't believe its been 25 years! i remember the purple footprints, too, but that would have been in the early 90s. so maybe it was done every 5 years or so? This makes me want to cry. What an amazing job he did creating something so wonderful out of nothing! I think I'd about die to watch it razed right in front of me. As a fellow gardener, I understand what Adam means when he says they'd have been better off to kill him and leave the garden. An absolute shame. Adam was one of the most intriguing folks I new as a teen in the city back then. I think this spring I'll plant a bed of corn in his honor. What a beautiful thing. I too remember the purple footprints, cool! From the late 1980s, anyone remember the corn plants growing in the oddest places? The sides of buildings, stoops, empty tree planters, there were CORN plants. Some of them got to the point they had tassels. I loved it. The city needs more community gardens, not less. An amazing garden... 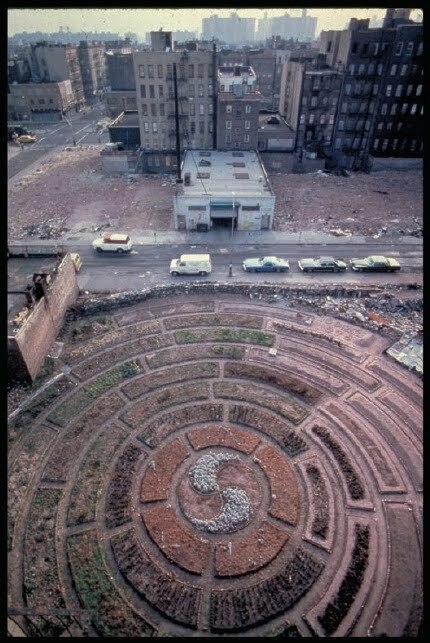 Funny, there will always be critics of how NYC was during the 70s and 80s and while you can't deny the blight or the crime, you also can't deny the vision and creativity from the community that lived through all of that--we had community gardens, salsa, punk, graffiti, modern dance, and thriving art scenes. Ditto with the Depression when I think of the jazz and swing eras and innovations in visual art, music, and literature across the globe. Hard times have rarely killed the creative spirit. 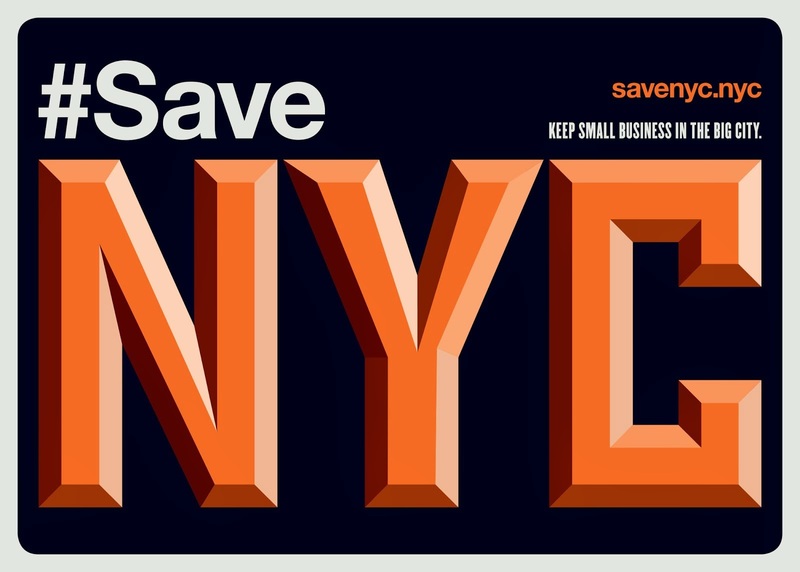 Yet today we're currently trying to get through one of worst economic downturns, and I can't help but feel that when this could be an opportunity ripe for cultural and creative inspiration, NYC couldn't be more bland and commercial. But I'll be the first to admit that I'm prone to nostalgia. It's all subjective. Some people love bland and you don't know what you're missing if you never knew what you had. Where exactly on Forsyth Street was this located? I'm surprised there's no mention of it here or in the video. Dan - based on Adam's Forsyth St. address, it's the block bordered by Stanton, Rivington, Forsyth and Eldridge. This is one of the best things ever written on this blog. A salute to this man. I too was there and saw Adam everyday, riding up and down 5th Avenue, first their was Adam then his Wife and then their Child. I Looked for him when I returned 3 years ago. 5th Avenue wasnt the same, Ny wasnt the same, But I did see him in MInds Eye. Claibel, Love your post, I agree with you also.